Creating a grid of data is a common task when building a dynamic website. I recently started looking for a good grid component that would play nice with both JQuery and ASP.NET MVC. The solution I ended up with is jqGrid. I’m going to walk through a simple example of setting up a grid and populating it via JSON with an MVC controller. I’ll also show how to add, edit and delete rows to the grid. This really isn’t as bad as it looks. Once you start getting into jqGrid, I suggest spending some time getting familiar with the wiki, I spent a lot of time there learning how the plugin works. I will explain some of the important pieces. First, the url above is set to /Home/SampleGridData. This means that I have a method in my home controller called SampleGridData that is supplying me with the data to fill the grid. The format that jqGrid expects is pretty particuliar, you can see from the documentation what is expected. There are a lot of options available to configure in the grid. I want to quickly touch on some of the options I used in this sample. A lot of your configuration is going to happen in the colModel section. Here you can set up the width of your fields, the data types, etc. More importantly, you can set up which columns are hidden, and what the validation rules are for your columns. I didn’t show it, but you can also set up custom field validation as well as custom data formatting rules. I used the editrules section for each column to mark any fields as required that I wanted, and I also took advantage of being able to set up my Email field as type ‘email’’. This allows the grid to check to see if the input is in the correct format. You can also make any column sortable by just applying the sortable: true parameter. For the sake of the example I’m doing everything in the controller rather than implementing a repository, which I would normally do. One thing to point out, I did not choose the parameter names in this method. (with the exception of search, but we’ll get to that later) This is the data that jqGrid is going to post to my controller to handle sorting, paging, filtering, etc. You may notice above that my OrderBy statement is taking a string parameter. This is possible through the LINQ Dynamic Query Library, which allows you to use string based expressions rather than type safe Lambda expressions in your queries. Using this library allows me to use the sorting and ordering columns that are passed in from the grid directly. Make sure that your client indexes match your database column names or this will not work! This form is constructed using the properties set up in the ‘colModel’ section of the grid call. 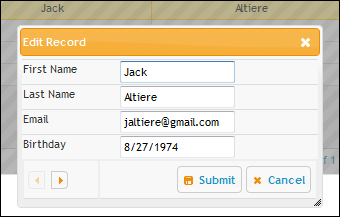 Every field set up with the property of editable: true will be displayed on this form. If you notice, the ID field is not showing up in this example, although it was marked as an editable field in my grid setup. The reason for this is that I wanted to send the UserID to the controller, but I didn’t want the user to be able to edit it. To accomplish this, I added a little bit of jQuery to my grid setup and hid the column. 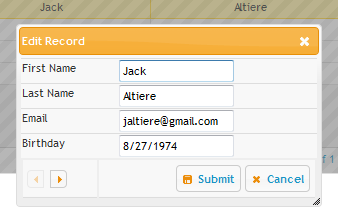 At the same time, I leveraged jQuery UI and made my Birthday field a datepicker. I handled both of these things using the beforeShowForm event available in the grid. The grid assigns ID’s in this way according to your column indexes. Since my ID field is named UserID, I can access it’s row with the selector of $(“#tr_UserID”) and my birthday textbox with the selector of $(“#Birthday”). As you can see from the client code, I’m setting up a method in my Home controller called AddSampleGrid to process my grid data. // Do some error logging stuff, handle exception, etc. The grid will pass the parameters according to their name on the colModel, so catching them and setting them up is a breeze. Editing a record is basically the same process as adding, the only difference is that you are sending the ID along with the rest of the data. You could easily combine the two operations into the same controller method if you want, although I normally separate them. I’m using the same trick to hide the ID field from the edit form, but the key here is that it’s actually being sent to the controller so we can use it to figure out which record is being edited. The dialog for editing records is nice in jqGrid. It allows you to edit the highlighted row, and you can also use the navigation errors on the bottom left of the dialog to cycle between records. 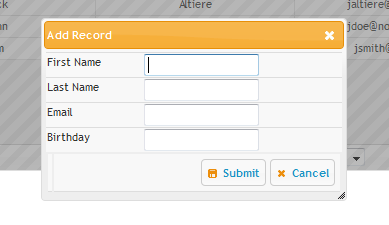 The controller method for editing a record is similar to the add method, we just have to load the correct user and edit the fields as shown here. Deleting a record is trivial with jqGrid. The grid will pass a parameter called id, and you can use that to delete the record in question in your controller. While this is nice, I generally like to implement a more generic filter. I want the user to just have to type in what they are looking for, and I’ll search all the relevant fields. This is pretty easy, and it’s what I was using the search parameter for in the original SampleGridData method. With just a quick check to see if I have a search string and a minor modification to the data call, I can quickly filter the grid on any field I want to. All in all, I feel that jqGrid is a nice plugin that allows you to quickly and easily set up grid data on your site. If you are already using jQuery UI, the fact that this grid integrates well with it is just icing on the cake. I’ve only scratched the surface with what is possible using this plugin, so be sure to check out the product wiki. The good news is that this product is well documented, and there are a lot of examples available to get you up and going. I have been trying different combinations of tools / plugins for my blog, and now that I’m finally happy with the setup I have I thought I’d share how I’m doing things. First, I host my own instance of WordPress to handle the site. There are several different blog engines available, but WordPress is the only one that I have any real experience with. It meets all of my requirements for a blog engine. There are a lot of free templates available. This is important to me, because I’d like to have a decent looking site and I’m by not a good graphic artist. It’s easy to update. WordPress used to be a pain to upgrade, but now it is very easy. You can upgrade to a new version with the click of a link from the administrative interface. There are plenty of nice third party plugins and widgets available. I want to focus on writing content, not playing around with my website. It’s written in PHP, so it’s easy to get in there and modify stuff if I absolutely have to. Next, I publish all of my content with Windows Live Writer. This tool is simple, and it integrates well with WordPress. It does have one quirk that I had to get around however. I want to be able to edit content from more than 1 computer, and I don’t want to have to carry around a USB drive to accomplish this. To solve the first part of the problem, I’m using Live Mesh. With this, you can set up folders that are shared across as many PC’s as you want to. You get 5 GB of space for free, and it’s a snap to install. I installed Mesh on the computers I would potentially be writing content with, and then I created a Mesh folder called My Weblog Posts. In this folder I have a Drafts folder and a Recent Posts folder. This is important, because it addresses the pain point I have with Live Writer. In Live Writer, you can’t specify where you want your drafts to be saved. By default drafts get saved to Documents / My Weblog Posts / Drafts. What I did was delete this directory after installing Live Writer. Then I created a symbolic link to the directory I set up in Mesh, which ends up sitting on my Desktop with instructions found here. I’ve done this on both Windows 7 and Vista machines. Make sure you run cmd.exe as an Administrator so you have sufficient privileges to create the link. So when I’m done, my Documents directory has a link to my Mesh folder structure to save Drafts, as seen by the icon next to the folder below. I give credit to Justin Etheridge for this idea, this came out of a conversation we had at the Mix 10 conference last month. I don’t remember exactly how he does it, but our conversation inspired my new setup. For image editing, I use Paint.Net. If you aren’t already using this tool I highly recommend it. It’s everything that Paint SHOULD be. Lastly, I use Google Analytics to look at how traffic to my site is looking. They added a new feature called Intelligence that allows you to set up custom daily, weekly, and monthly alerts. This allows you to get email if certain criteria happen. For example, you can set up daily alerts to let you know that you got 50 new visitors, or that you got 500 visits, or that someone reached your site by using the keyword jquery in a search 10 times. It really is a cool feature, and they have a few pre-canned alerts you can use to get you started. That’s my setup. I’m able to edit drafts on any of my PC’s and I finally have a syntax highlighting product that I’m happy with. One thing I should point out, my method of sharing drafts should only be used for drafts. I think that this would break down if you tried to edit posts that are already published from a different PC because of how Live Writer generates an ID for each post.